Sometimes, life forces us to make difficult decisions. I'm not too great at making them, as it goes. I'll go back and forth between my options roughly a zillion times, consult everyone in the vicinity and then, usually, change my mind again at the last minute. An unlucky waitress found this out when trying to take our order at The Venue. We were trying to decide between lobster and steak. Lobster... or steak. The lobster, I knew, was amazing. 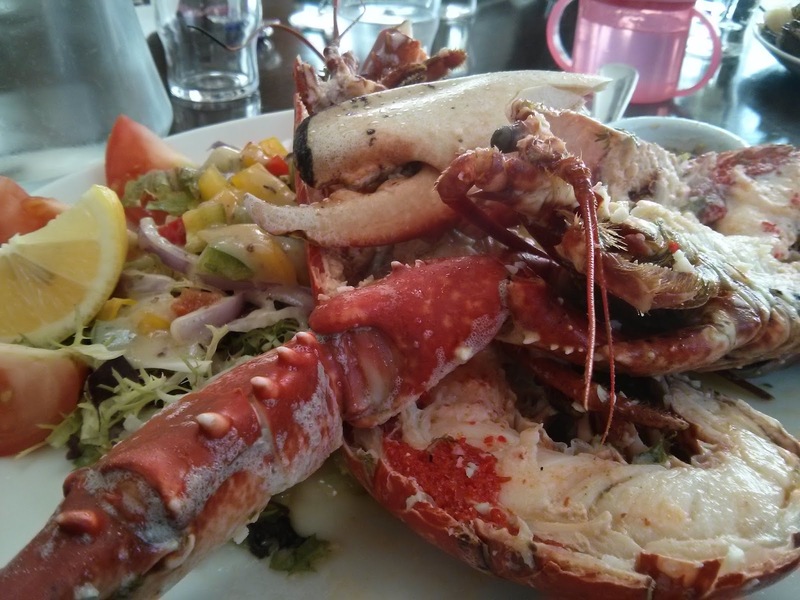 Plump, tender, juicy, and plucked from the waters of Maugherow just around the corner. But the steak... the steak I could guarantee would be out of this world. 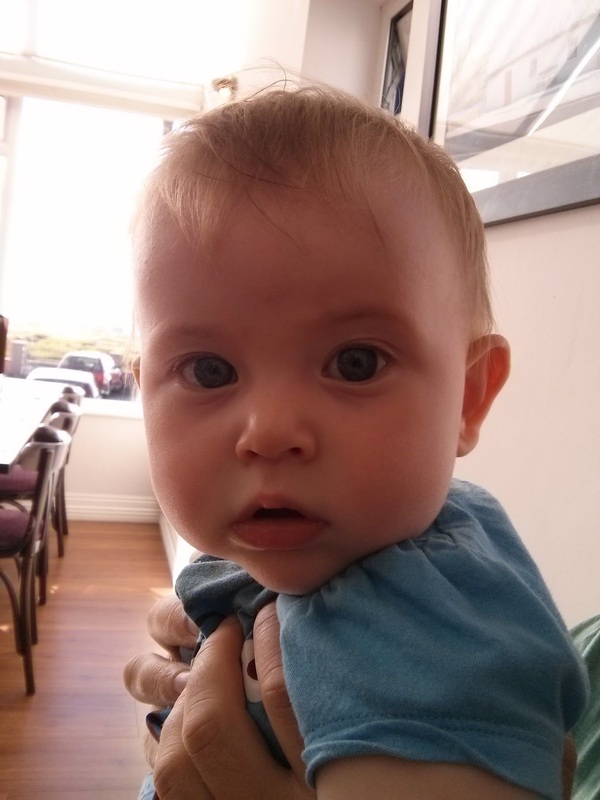 I was in Strandhill with my good friends and their baby. I had been with one of them a few years earlier, and since then, we had frequently referred to the amazing steak and lobster night we had there. I think the practicalities of the night had shifted a bit over the years - I could have sworn that we both had steak topped with a lobster tail, but I think what actually happened is that we shared half a lobster to start, and followed with the surf and turf, which is actually served with huge king prawns. However this worked, I know for a fact that the meal came with a little silver jug of garlic butter, which we practically drank. We had told the story countless times, and it was about time we took Rob there. On this occasion, we were taking an aaaaage to decide what we wanted. The waitress must have come to our table five times before we had the vaguest of ideas what to choose. Each time I thought we were close, someone would panic and go back to the drawing board. I was more nervous that I would be the one left out. Say, if they both got the steak, and I got the lobster, then I'd have to give up far too much of my own dish for their selfish tasting. And if they got one of each, and swapped half way, then I'd be so jealous I couldn't even stand it. If we all got the same thing, we'd get no tasters at all. It was a MINEFIELD OF AWFUL DECISIONS. We did decide pretty quickly on a platter of chicken wings to start, just to make some kind of decision. It was a bit of an odd choice, but one that I'm so glad was made. I didn't get a chance to take a picture before we devoured close to 30 wings, each perfectly crisp, sticky and spicy. Proper New York style Buffalo wings, with no salad mugging you off. Just a huge platter, brimming over. The waitress came to Rob, who had come up with a genius solution. "Do you do a surf and turf option, with the steak and lobster?" The waitress went off to check in the kitchen. "We don't, I'm afraid. But you can just have both?" And that's the story of how Rob had two dinners. He had one steak. And he had one lobster. You know, he didn't even get the small steak. He got the big daddy T-Bone. 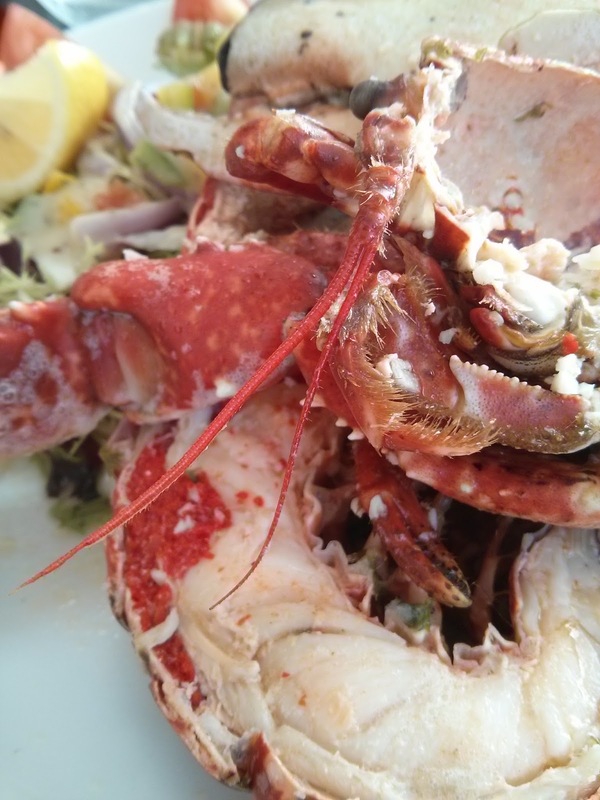 He did, IN FAIRNESS, get the half lobster, rather than the full one. But still. It was an impressive effort. 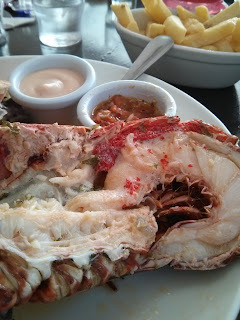 While the taste of steak I had was delicious, I was so glad to have gone for the lobster. You really can't beat a Maugherow lobby (please don't tell anyone there I called it a lobby) The meat is insanely tender and plump, and the garlic butter dripping all over it is a marriage made in heaven. Their chips let things down a little (why is it so hard to find decent chips?) but there's so much butter in the equation it really doesn't matter. Rob made light work of his double dinner. And then we had pudding. In our defense, we only had two between the three of us. And this one didn't help us with it at all, choosing instead to lick a radiator. 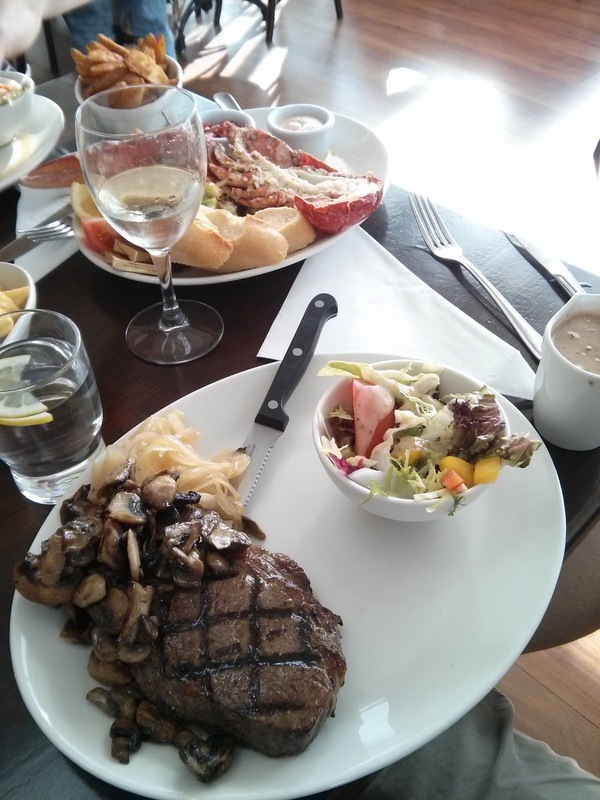 We had made an early booking, as it was a bank holiday weekend, so were seated easily at 5pm. Yes, 5pm. Technically, it was a very late lunch. When we were finishing up, the place was jammers, so a weekend reservation is recommended. The Venue isn't much to look at from the front, but when you walk in (through a tiny and dark old pub) the restaurant opens out, with huge windows looking over the sea and filling the room with light. If you can time your dinner with sunset, and snag a window table, you're laughing. Just be sure to bring an appetite.